This home incorporates modern styling, strong brick forms and timber which help lift the roof-line. All this, paired with high glazing in the living, make this a home you cannot ignore. This design can be used in sections with driveways coming in from the east or west by simply flipping the garage, foyer and laundry if needed. Also if needed, an additional lounge can easily be added as an extra option. 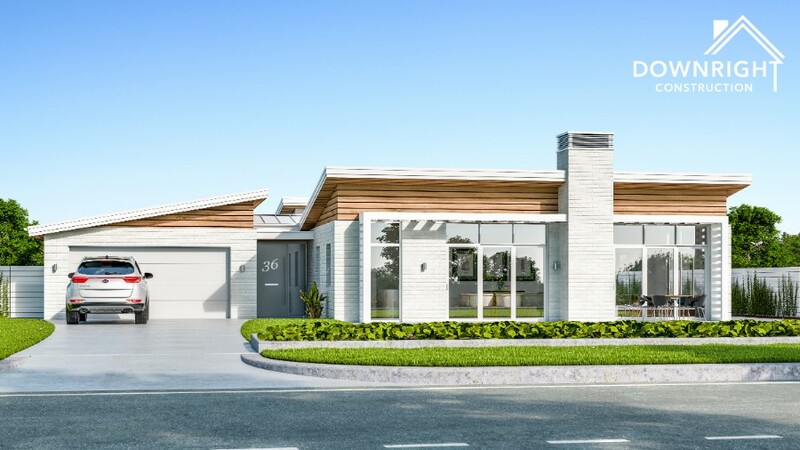 If you’re after a four or even five-bedroom home with some urban style, this may just have your name on it! I agree, this content is copyright. All plans and artist impressions are © Copyrighted. When downloading any Downright Construction's content, you are bound by New Zealand's copyright law. 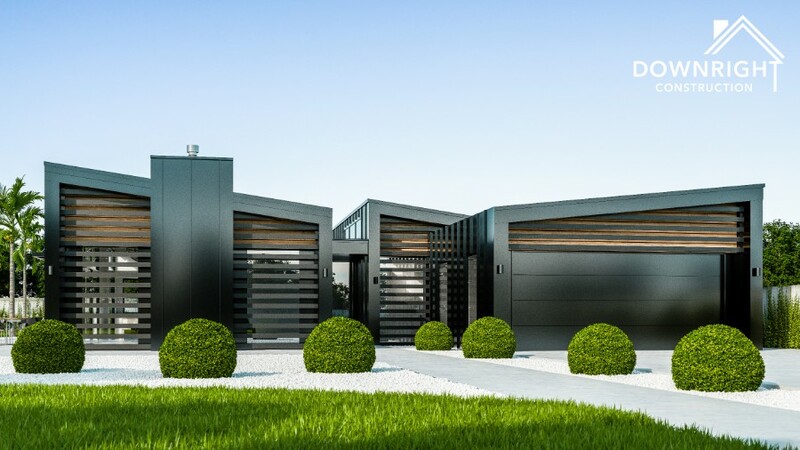 This modern four bedroom home has three core parts that make up its strong geometric frontage. When entering the foyer, a study slider can be opened so visitors can enjoy a view through full height glazing out to whatever centrepiece you desire. The dining takes in the morning sun from a large sliding window in the kitchen which drops right down to the bench level. Extra features include the scullery, a workbench within the garage and a large ensuite. If you're looking to build a bold home with a ton of features, this is it! 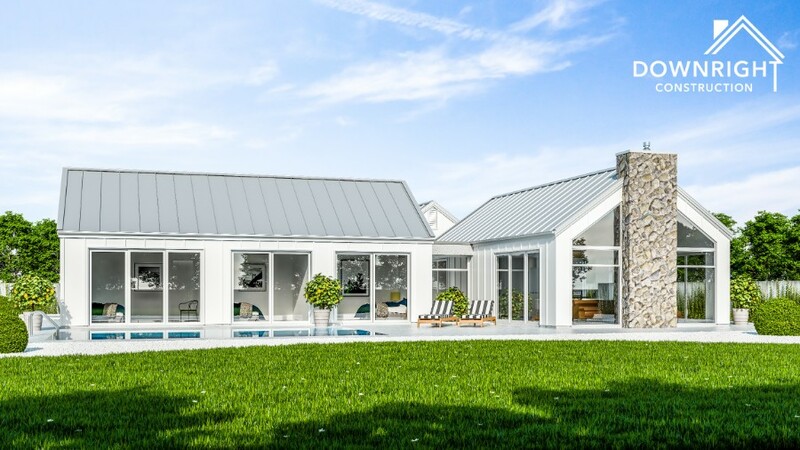 This modern farmhouse breaks the home into three clear pavilions, each housing a different part of the home; Garage, living and bedrooms. This design can work whether your driveway comes in from the east, south or west. Some nice features of this home include the scullery, dual outdoor areas for all day sun, large walk-in wardrobe and ensuite plus a centrepiece chimney, which frames two large gable windows. 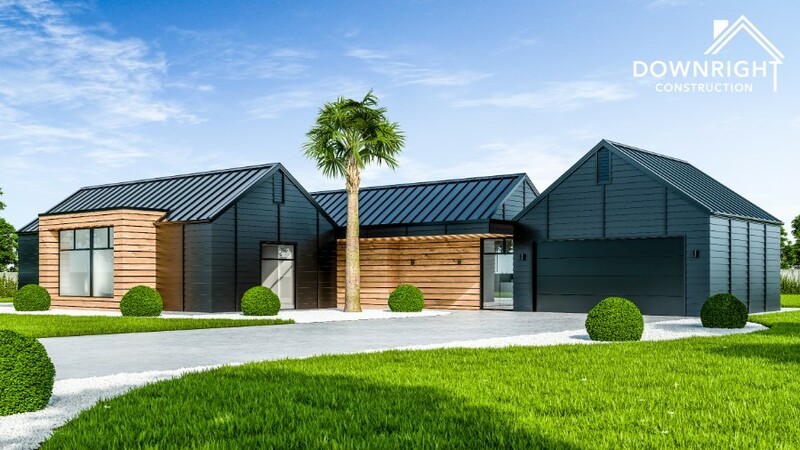 This is a modern farmhouse, a timeless design, a fine structure you could just be lucky enough to call home! This gable pavilion styled home is highly functional with a layout that will take full advantage of an expansive northern view. This design can be used in both wide sections and narrower deep sections with the garage simply rotated ninety degrees. An open study is positioned just off the foyer, perfect if you plan to work from home. Outdoor spaces are perfectly aligned for all day sun. 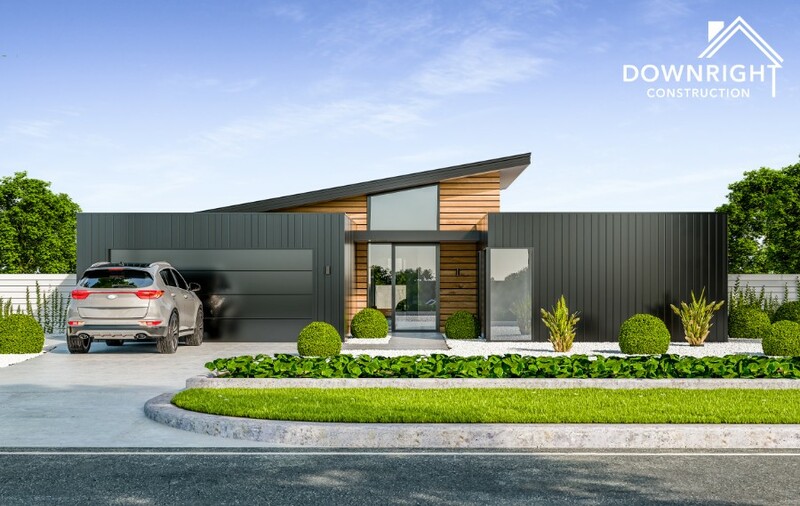 With this design being such an iconic shape with all the gables, by simply using differ-ent claddings and colours, this home can work with numerous styles, whether it’s modern, traditional or even Hamptons! This home has a lot of nice touches and not including the styling! inside, the scullery is set between the garage and kitchen allowing for a quick and easy grocery drop-off. A study is included, additional to the third bedroom, allowing you to work from home. Outside, a built-in pergola allows for optional outdoor cover options and overhead heating. This home will really help take your section to the next level! Quality, because its important to us. A high quality finish is included with every Downright Construction new home. We love building and a quality finish is the only finish we do! Full cover Insurance is included with every Downright Construction new home, protecting your investment with our extensive Halo 10 year New Build Guarantee. Clients always come first at Downright Construction. We will personally guide you through each step of your new home journey with frequent updates and support. 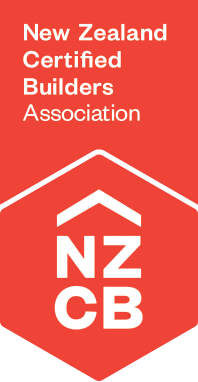 We’re new home and renovation specialists based in Auckland. All Our work comes with New Zealand's most comprehensive 10 Year Halo Guarantee. © Downright Construction Limited. All rights reserved.